Not everyone is satisfied with the traditional cat or dog as Pets. Some owners want to have more exotic Pets such as hedgehogs. Those who have home lives a hedgehog, it is usually poured him some milk in a saucer. So do those to whom the hedgehog came on a visit to the country. If a hedgehog is to give milk, it really starts to drink it, causing tenderness of the owners, who are convinced that animal likes milk. Love to milk is traditionally attributed not only hedgehogs, but also cats. It's hard to say what the basis of this belief, but it has nothing to do with reality. All mammals have milk intended for feeding calves. Adult individuals that can produce other food, it is not necessary and not available, so the digestive system adults stops producing the enzymes that break down those proteins and fats contained in milk. The mutation, which allowed to fully digest milk as adults, took place only in humans. 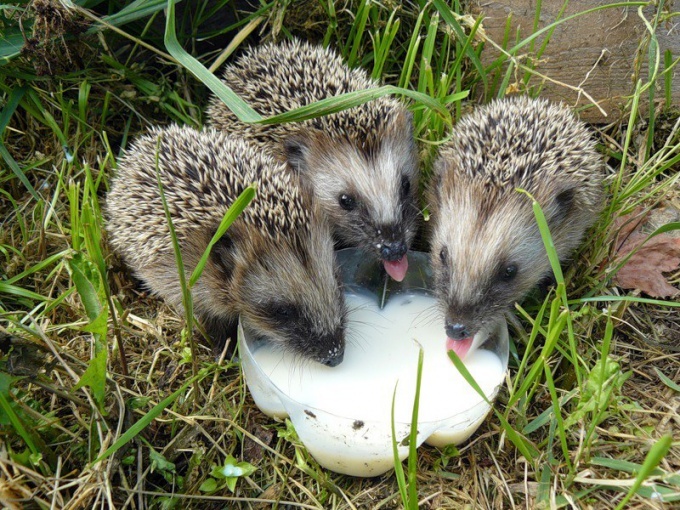 All other adult animals, including hedgehogs, milk is not only not useful, but can cause serious digestive upset – especially if we are talking about milk of an animal belonging to another biological species, e.g., cow or goat milk for a hedgehog. The fact that hedgehogs and cats drink milk if you give it to them, not to mention its usefulness: contrary to popular belief, animals do not always know themselves what they need" are not always from the food which is harmful for them. Hungry animals may pounce on the food, not quite suitable for him. Hedgehogs caught in human hands, do it with milk, if more suitable foods a person does not give them. However, the diet hedgehog may even need to add fermented foods – they contain enzymes, so their digestion is not a problem. You should not focus on more common misconception that hedgehogs love apples and mushrooms. It is a widespread opinion is based on pictures and children's cartoons, where sea urchins are often on the back of an Apple or a mushroom. In fact, any fruit can only by chance to cling to the spines of a hedgehog. Urchins eat plant foods in small amounts, so fruit and vegetables they should give a little and not very often. Hedgehogs eat insects, worms, mice, snails. At home, they must have veal, beef, chicken, fish, raw or cooked. You can feed mealworms, cockroaches, crickets, various beetles. However, even with a proper diet hedgehog will never feel good at home. It's not an animal that can be fully domesticated, and much pleasure to the owners he won't be – it's a night animal, day, Jerzy asleep. If the owners, wishing to communicate with the pet, will Wake him up in the afternoon, it will also be harmful to the health of the hedgehog. Matter how strong the temptation to catch in the forest of the animal and bring it home, you should not do it.